I have 3 blueberry bushes in my back yard. Birds got into my crop, leaving only one microscopic berry hanging on for dear life. Then a deer ate it. I didn't feel too bad, since by crop I mean usually 8 blueberries. I have to start taking better care of those bushes. I have been spoiled by the black raspberries (or blackberries) that grow wild in my side yard. I pretty much ignore them, yet they give me almost enough black raspberries (or blackberries) to start my own fruit stand. So I hit the Try-n-Save, where blueberries were on sale this week and picked up a few pints. I had found an intriguing recipe on a bakery blog and wanted to try it. The original recipe also used chocolate. Normally I like chocolate in pretty much everything but garlic toast. Bananas and chocolate are heaven on a frozen stick. 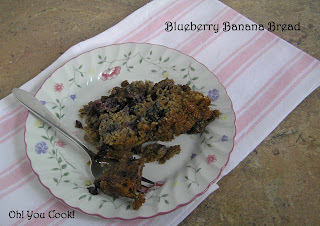 But for some reason the combo of blueberries, bananas and chocolate didn't interest me any. Today's post is for a new (to me) challenge. While trading emails on other business, Tamar, Director of Digital Media at Joy of Kosher, mentioned a kosher link-up going on over there. I am very happy to join a group of kosher bloggers! No disclaimer needed for this link-up. Yay! The theme is (are?) frozen kosher desserts. Except for selecting a recipe this challenge is pretty easy. There are very few frozen desserts containing meat. No, wait ... scratch that last comment. I hear that some people enjoy bacon ice cream. Sorry, not my cup of meat. 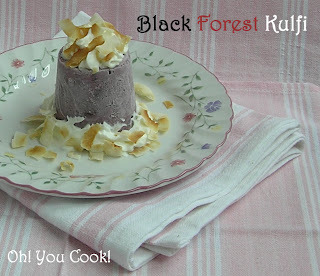 My contribution to the challenge today is Kulfi, an Indian style ice cream. Kulfis are traditionally made with whole and/or sweetened condensed milks laced with cardamon (a sweet spice), then frozen into a conical-like shape and topped with crushed pistachio nuts.